How silly it is of me, to review a film that is already… wow, seven years old. For some reason, I missed it back then, even though I have always been a huge fan of Keira Knightley and movies that have Dominic Cooper in them. 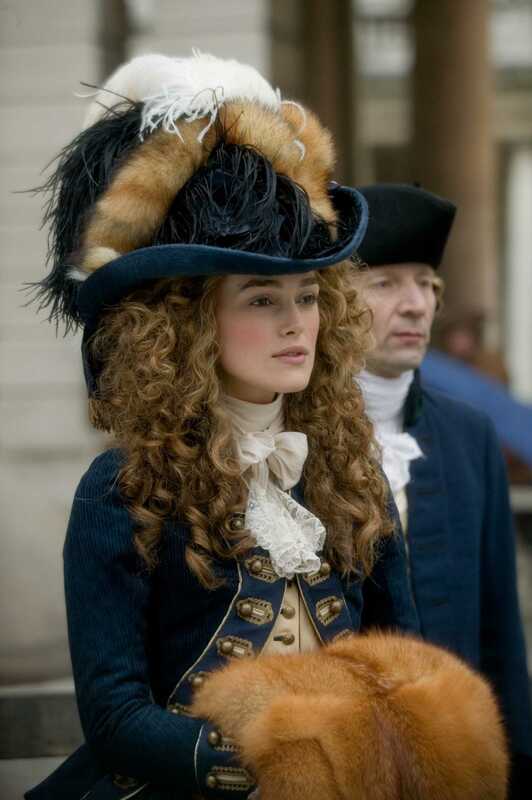 And I must say that finally watching The Duchess has been worth it, because it has truly fascinated me. And I’m not only talking about the wonderful work in the costume (which won an Academy Award) and hair departments. It’s the story itself, because I have the feeling that when we watch something that we know happened in real life, we feel more drawn to it, more involved (or that is what I’d like to think). The Duchess is based on Amanda Foreman’s Georgiana, Duchess of Devonshire, a biography about the celebrated socialite who married, at the age of seventeen, the 5th Duke of Devonshire (you know, that family that owns the majestic Chatsworth House – Pemberley in Knightley’s Pride and Prejudice). Her life, as you can guess, wasn’t particularly happy, considering that all her aloof husband expected of her was to give him a male heir, a task that took her 16 years after several miscarriages and two daughters. Not only that: Georgiana raised the Duke’s illegitimate daughter as her own, and had to endure seeing how he took Georgiana’s best and only friend, Bess, as his mistress (Georgiana eventually decided to put up with it and accepted it, even giving them their blessing to get married after her death). And if all this wasn’t unfair enough, the little love she had in her life, from Charles Grey (yes, the one the tea is named after), was tragically taken from her as she was forced to stop seeing him and give their illegitimate daughter to Grey’s parents. I know, quite a drama, everything so tragic. And yet, she managed to always smile in public, concealing her pain and making absolutely everyone around her love her. This is what makes her so utterly fascinating. I already bought Foreman’s book to learn more about her life. The acting, needless to say, is superb, from my dear Miss Knightley as Georgiana to the always grand Ralph Fiennes as the Duke, Hayley Atwell as Bess and Dominic Cooper (you know when you just have a soft spot for someone that you can’t explain? That’s what happens to me with Cooper) as the 2nd Earl Grey. There really isn’t much more to say about it, only that, if you haven’t had time in these past eight years to watch The Duchess, you should do it now. The dresses, the locations, the gardens, the music… What can I say, I just love it when they get a period film right.